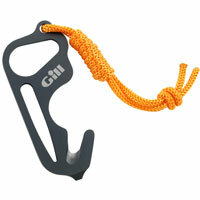 Gill’s Harness Rescue Tool a great idea for any sailor wearing a safety harness and tether. This emergency cutter will slice through webbing and is easily carried in your foul weather gear or life vest. Who hasn’t heard the old salt’s advice that a sharp knife is sailor’s best friend? 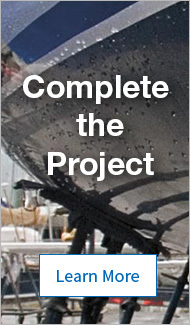 It could be a lifesaver in a situation similar to that which happened to the Kiwi 35 sailboat, Wingnuts, in the 2011 Chicago to Mackinac Race, where the boat was capsized and turtled by an extremely powerful microburst with several members of the crew trapped underneath the vessel, held by their safety harnesses and tethers. But first and foremost, a good boating knife is a useful, practical and important rigging or utility tool and should be part of every boater’s standard safety gear. Withstand the temptation of using sharp kitchen knives for anything but galley duty. They do not resist corrosion, they don’t fold, they aren’t meant to be carried in a sheath and they don’t have handles that are safe for cold and wet hands. Plus last time we checked, kitchen knives didn’t incorporate a bottle and shackle opener or a marlinspike. Marine Rescue Knife is a good, inexpensive non-folding choice for meeting the ISAF requirements for offshore racers. Smooth or serrated edge: Serrated blades often outperform smooth-edged blades because the cutting angle and the pressure at the point of contact change constantly, which helps breaking down the bond of cohesion in the material of your work piece. If cutting rope is one of your knife’s primary uses, a serrated edge without long points is the way to go. As a compromise, we recommend partially serrated blades. On the flip side, serrated edges can be challenging to sharpen, so you may find it easier to keep a conventional edge honed to a sharp edge. Pointed or blunt: This choice depends on where you carry your knife and its intended use. Safety knives that are worn on the outer layer of gear and have to be accessible at all times should have a blunt point to reduce the risk of injury to yourself. We recommend the modified sheepsfoot design with a drop point for fine work and a slight belly for general utility. Pointed blades are much more common in folding knives, but may stab or jab the underlying surfaces, such as the bladder of your inflatable life vest or the flotation tube in your life raft. Fixed or folding blades: This is an issue of size, portability and ease of deployment. Typically, a folding knife offers higher portability because it is more compact and easy to carry, so you’re more likely to have it on you. Most folding knives incorporate other handy tools such as a marlinespike, bottle- and shackle-opener. The downside is that folding knives are harder to deploy in an emergency, so you should consider models with mechanisms that can be opened and closed with one hand. Look for a thumbhole in the blade or a thumb stud near the blade’s pivot point. A fixed-blade knife, like Myerchin’s Fixed-Blade Offshore Knife, offers ultimate deployability, because once you have it out of the sheath it is ready to use. But they are larger and more cumbersome when worn on the belt. Like PFDs, knives are only useful in emergencies when they are with you. Therefore we like fixed knives in cushioned sheaths or folding knives that can be deployed with one hand. Comfort & Safety: Before buying any knife you should make sure its handle fits your hand. There should not be any protruding parts digging into your skin. Hands-on testing may sound funny in the context of knife selection, but pick up the knife and see how the handle feels when you apply pressure. A series of ridges on the back and the base of the blade is a smart safety feature that helps orient the knife in the dark and when your hands are cold and wet. We also like grip contours and notches on the top or the bottom of the handle that prevent the fingers from sliding onto the blade. Magnetic Interference: The more iron a knife’s blade contains, the harder it is and the better it retains its edge. Unfortunately, magnetic compasses like iron too, so much so that they go nuts when you store a knife in the immediate vicinity. If you are worried about magnetic interference, which could be an issue for accurate navigation with a magnetic compass, you may want to look for knives with “exotic” (e.g. cobalt, titanium ceramic) blades. Corrosion resistance: Steel that offers high corrosion resistance tends to be softer, and unfortunately less likely to hold a sharp edge, so this is an area of compromise. If corrosion is one of your main concerns, look for blades with a powdercoat finish, hardened 410 or 440C stainless steel. We also advise you to take the term stainless with a grain of salt, because blades that have enough carbon (which is essential for good cutting performance) still have a tendency to corrode under damp and salty conditions if you neglect to perform basic maintenance. Frankly, a little corrosion on a sharper blade is a compromise we’re willing to accept. Sheath or clip: Think of where you’d have to wear your knife. Are you a trapeze dinghy sailor who wears a life jacket? In this case a knife should attach to a clip on the outside of the PFD so you can get to it at a moment’s notice. An adjustable snap fastener probably works best for this application. If you need your knife for multiple purposes, you may be better off with a sheath (standard accessory for most fixed blades and folding knives). In any case you should attach a safety lanyard, either in the provided hole in the handle or on another suitable spot of the knife. It may be the difference between having and not having a knife when you most need it. West Marine sells two rigging knives with our brand, our very inexpensive Stainless Steel Rigging Knives (with a choice of straight or serrated blades) and the Performance Rigging Knife, made for us by SOG. We enjoy using this knife, which we designed ourselves. With a combo straight/serrated blade, it works well for cutting natural or synthetic rope. A pushbutton lock secures the marlinespike in the open position for safe use and the glass-reinforced handle is impervious to salt water for long life in the marine environment. It is 7 5/16" in overall length, with 2 13/16" drop point blade. After use in saltwater, rinse your knife with fresh water. This is especially important for the pivot and lock mechanisms in folding knives. Afterward, dry your knife and apply protective coating such as Sentry Solutions Marine Tuf-cloth or Militec 1 Metal Conditioner. Tuf-cloth inhibits corrosion with a dry film that is rubbed on. It leaves a crystal barrier that displaces water, protects against rust and wear and does not wash off. Militec 1 Metal Conditioner acts as a sealer forming a chemical bond with the microscopic pores in the metal. It also provides lubrication and protection against corrosive effects. To keep the edge honed, you need a good sharpening kit or a set of ceramic cross-sticks. Practice deploying your knife while back on land. Opening folding knives with one hand is a skill that requires practice. Study the methods for opening and closing and understand how the locking mechanism works. You ought to be able to do it blindfolded, because one day, your life may depend on it.